Star Wars: Galaxy's Edge isn't just a Disney Parks attraction. It's a fully immersive experience that will expand to other forms of media. And that includes a Marvel comic book, which will arrive sometime this spring, letting potential park goers get a sneak peek at what they can expect. This will be an interesting addition to the Disney Star Wars canon, as it will expand the mythology behind Battu, the planet where Star Wars: Galaxy's Edge is set. There have been plenty of Star Wars comics over the past 40 years, but perhaps none quite like this one. The Star Wars: Galaxy's Edge comic book will arrive months before the attraction officially opens to the public, and it will serve to further the synergy held between Disney and its two biggest offshoots with Marvel and Lucasfilm. The comic will be a limited miniseries that spans 5 issues in all. 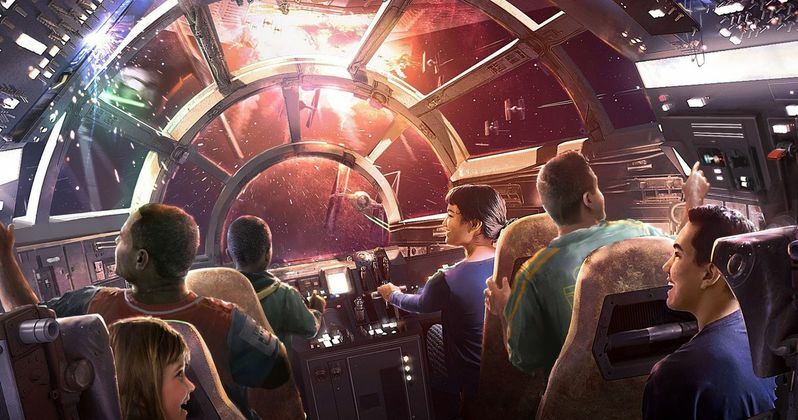 It will offer longtime Star Wars fans a first look at the mythology behind what they'll get to experience for themselves, with the attraction coming to both Disney World and Disneyland. The story will include the introduction of the Black Spire Outpost, which tourists will get to visit inside the park. Dok-Ondar will also make its debut in the pages of this Marvel comic, showing off this 'collector of rare antiquities' only located inside the attraction. Ethan Sacks is writing all five issues of the comic miniseries. Will Sliney will be providing the art. He previously worked on the comic adaptation of the standalone movie Solo: A Star Wars Adventure. He also did the Beckett one shot special, based on Woody Harrelson's character from that disappointing chapter in the Star Wars big screen series. "Our series will give fans the chance to visit Black Spire Outpost months ahead of voyaging to Batuu in person. Armed with top-secret sketches and information from Walt Disney Imagineering and Lucasfilm, we are keeping this authentic to the spirit of this rich new setting. I'd tell you more, but I already have the death sentence on 12 systems..."
Marvel is tripling down on its Star Wars titles as of late. There are plenty of other Star Wars themed books planned for the near future. And Star Wars: Galaxy's Edge will be the fifth first issue for a standalone line in April alone. Other Star Wars comics coming this spring include Star Wars: TIE Fighter, Star Wars: Age of Rebellion - Princess Leia, Star Wars: Age of Rebellion - Grand Moff Tarkin and Star Wars: Age of Rebellion Special. So you better take a second mortgage out on your home if you want to collect them all. Also coming in April, though already launched, are the Star Wars titles Star Wars, Star Wars: Doctor Aphra, Solo: A Star Wars Story Adaptation and Star Wars: Vader - Dark Visions. Star Wars: Galaxy's Edge has some cache outside the world of comics, though, as park enthusiasts, Disney fans, and Star Wars devotees all want to get a firsthand look at this new park attraction for themselves, even if they've never picked up a Marvel Star Wars comic before. This comes to us from The Hollywood Reporter.